These tutorial notes present a methodology for spreadsheet engineering. First, we present data mining and database techniques to reason about spreadsheet data. These techniques are used to compute relationships between spreadsheet elements (cells/columns/rows), which are later used to infer a model defining the business logic of the spreadsheet. Such a model of a spreadsheet data is a visual domain specific language that we embed in a well-known spreadsheet system. The embedded model is the building block to define techniques for model-driven spreadsheet development, where advanced techniques are used to guarantee the model-instance synchronization. In this model-driven environment, any user data update has to follow the model-instance conformance relation, thus, guiding spreadsheet users to introduce correct data. Data refinement techniques are used to synchronize models and instances after users update/evolve the model. These notes briefly describe our model-driven spreadsheet environment, the MDSheet environment, that implements the presented methodology. To evaluate both proposed techniques and the MDSheet tool, we have conducted, in laboratory sessions, an empirical study with the summer school participants. The results of this study are presented in these notes. This work is part funded by ERDF - European Regional Development Fund through the COMPETE Programme (operational programme for competitiveness) and by National Funds through the FCT - Fundação para a Ciência e a Tecnologia (Portuguese Foundation for Science and Technology) within projects FCOMP-01-0124-FEDER-010048, and FCOMP-01-0124-FEDER-020532. The first author was funded by FCT grant SFRH/BPD/73358/2010. 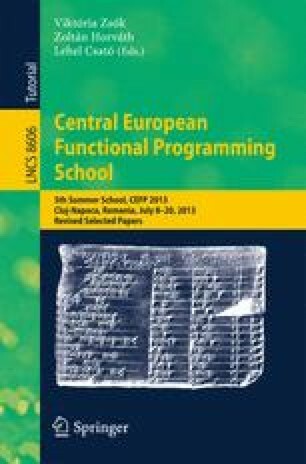 The theories, techniques and tools presented in this tutorial paper were developed under the project SSaaPP - SpreadSheets as a Programming Paradigm: a research project funded by the Portuguese Science Foundation (contract number FCOMP-01-0124-FEDER-010048). We would like to thank the members and consultants of this project who made important contributions for the results presented in this document, namely: Rui Maranhão Abreu, Tiago Alves, Laura Beckwith, Orlando Belo, Martin Erwig, Pedro Martins, Hugo Pacheco, Christophe Peixoto, Rui Pereira, Alexandre Perez, Hugo Ribeiro, André Riboira, André Silva, and Joost Visser.